London, May 9: For people with receding hairlines, help may soon be on the way, as scientists have identified a drug - originally designed as a treatment for osteoporosis - that can stimulate hair growth. 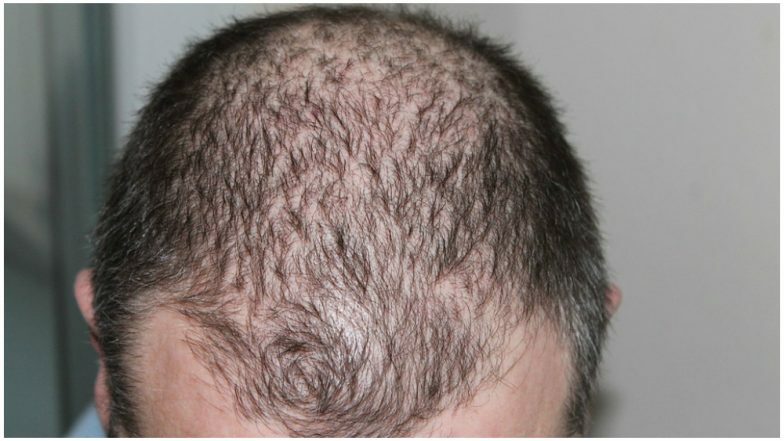 In a study published in the journal PLOS Biology, researchers from the University of Manchester in the UK showed that the drug has a dramatic stimulatory effect on human hair follicles donated by patients undergoing hair transplantation surgery. Researchers sought to develop new ways to promote human hair growth with the hope of finding novel, well-tolerated agents for treating androgenetic alopecia. The approach was to first identify the molecular mechanisms of an old immunosuppressive drug, Cyclosporine A (CsA). Cyclosporine A has been commonly used since the 1980s as a crucial drug that suppresses transplant rejection and autoimmune diseases. However, it often has severe side-effects, the least serious - but most interesting - of which is that it enhances cosmetically unwanted hair growth. The team carried out a full gene expression analysis of isolated human scalp hair follicles treated with CsA. This revealed that CsA reduces the expression of SFRP1, a protein that inhibits the development and growth of many tissues, including hair follicles. This identifies a completely novel mechanism of action of this old and widely used immunosuppressant. The research also explains why CsA so often induces undesired hair growth in patients as it removes an inbuilt and potent molecular brake on human hair growth. The inhibitory mechanism is completely unrelated to CsA's immunosuppressive activities, making SFRP1 a new and highly promising therapeutic target for anti-hair loss strategies. Researchers found that a compound originally developed to treat osteoporosis, called WAY-316606, targets the same mechanism as CsA by specifically antagonising SFRP1. When he then treated hair follicles with WAY-316606, the unrelated agent also effectively enhanced human hair growth like CsA. The external application of WAY-316606 or similar compounds to balding human scalp, he argued, may promote hair growth to the same magnitude as CsA or even better, but without its side effects. "We were able to conduct our experiments with scalp hair follicles that had generously been donated by over 40 patients and were then tested in organ cultures," said Nathan Hawkshaw who led the study. "This makes our research clinically very relevant, as many hair research studies only use cell culture," Hawkshaw said. "When the hair growth-promoting effects of CsA were previously studied in mice, a very different molecular mechanism of action was suggested; had we relied on these mouse research concepts, we would have been barking up the wrong tree," he said. "The fact this new agent, which had never even been considered in a hair loss context, promotes human hair growth is exciting because of its translational potential: it could one day make a real difference to people who suffer from hair loss," he added. "Clearly though, a clinical trial is required next to tell us whether this drug or similar compounds are both effective and safe in hair loss patients," Hawkshaw said. Sonali Bendre Health Update: Is The Actress Going Back to NYC to Continue With Her Cancer Treatment?